I'm guessing this is the correct term for them....the power tube retainers won't open up enough to allow my RCA 6l6's to insert and secure...but my Tung sol 5881's do..I'm guessing because the base is slightly smaller..
any thoughts on how to correct?...I doubt I'll spend too much time on it and send it out for a good thorough servicing, but I'm curious as to the fix. If you're referring to the 'bear trap' retainer (link), the thing to do is to use needle-nose pliers to change the orientation of the spring jaws, as well as the little teeth (if equipped) to grip the tube's base. It usually takes just a little bending to achieve success. ..are you referring to the "bear trap" type retainers? They can be hard to disengage sometimes but usually with equal downward pressure to both sides while gently pulling up on the tube, they will let go and come out. Sometimes you have to very slightly rock the tube from side to side...taking GREAT care not to break the plastic tube pin index (Keyway) that is inserted in the socket. bear trap is an excellent term for them...;-0.....thanks for the tip..
Yep, you have bear traps and they are quite common and should release your 6L6GC tubes with some pressure and perhaps readjustment of the clamps. Those socket savers have some good use purposes, but I would not use them in a tube amp as the tubes are apt to fall out or become "cockeyed" in the socket which is a bad thing. :) We use them in tube testers to keep from wearing out the sockets from so many insertions and removals. Ok...posted a pic...I tried to carefully bend them to allow tube to fit but still not enough room...even if there were no teeth it looks to be too small. ..and.... is there any way to replace the original clamps without replacing the socket?...I'll need one for the rectifier anyway.. Yes, the same pair of screws that hold the tube socket in place also hold the retainer clips in place. Some amps (certain Peaveys come to mind) have the tube sockets riveted on the chassis, and some amps have the sockets simply soldered to a PC board with no way of attaching a tube retainer to the socket. WARNING: if you do decide to pop open the chassis and remove the socket screws, discharge the filter caps before doing anything else. You might have big DC voltage at the socket connections. Always discharge the power supply filter caps and then use a meter to check for any residual voltage before proceeding. Yeah, those are the flat ones, and they close up too soon to be of any help with larger tube bases. The one in my linked pic is three times as tall and opens up larger. But you have other issues: yours are riveted in place. You can remove that type of metal rivet by carefully collapsing the rolled end into itself with a small plier and pushing the rivet out. 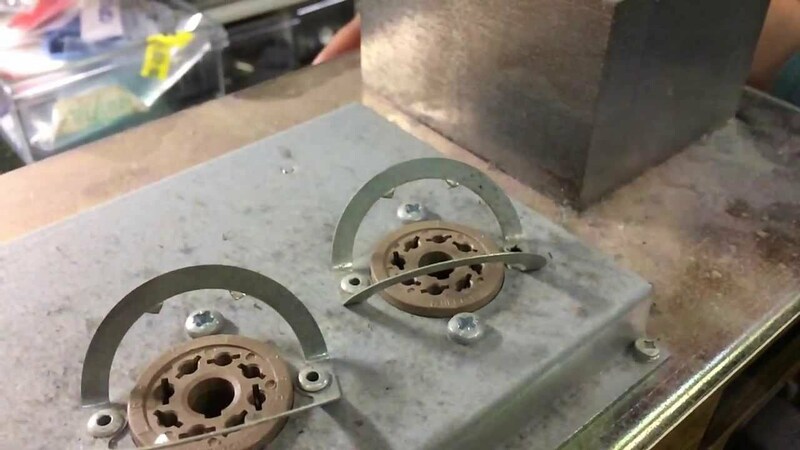 Next, get some small 6-32 or 8-32 machine screws and nuts, and use them to reinstall the new bear traps and re-secure the sockets to the steel chassis. The screws go from 'outside to inside' the chassis, meaning the nuts go on the backs of the sockets. Use blue Loctite on the nuts. Measure your mounting hole's separation before ordering! "WARNING: if you do decide to pop open the chassis and remove the socket screws, discharge the filter caps before doing anything else. You might have big DC voltage at the socket connections. Always discharge the power supply filter caps and then use a meter to check for any residual voltage before proceeding." but I appreciate your concern bro!! would you be interested if I decide to go that route?.. the advice and support from this place is easily worth another star! I think it's very cool that you summoned the intestinal fortitude to crack this nut. There is always so much more to learn. The day you quit learning...may as well get out the shovel. oh I'm sure willie's not starving..;-0...but his email to me and his willingness to take on the project won me over..
actually it wasn't difficult... I was just being a lazy old fart...but my friend shamed me into it! ever think about what this stuff will be worth in 50 years...or even longer?